While there are many wonderful things about soaping, perhaps one of the best things is that it can be enjoyed by anyone. 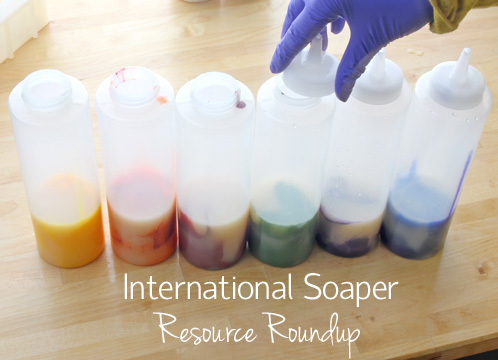 No matter what level of craftiness you are or where you live in the world, most any adult can take up soapmaking. On our Facebook page, we regularly see soapy creations from all corners of the world, from Mexico to Iceland to Taiwan. Creating small, handcrafted products make us part of a global community. Soapers abroad encounter all kinds of challenges trying to obtain soapy products. International customers deal with a whole new set of rules, from international shipping restrictions to import and export regulations. If you’re an international soaper, read on to learn more about our international distributors, how to place an international order and other special circumstances and considerations. We understand that international shipping rates aren’t always the most affordable. Luckily, we’re in contact with three other soapy companies that might be a better option for our international friends. If you live in Australia, New Zealand or Southeast Asia: Aussie Soap Supplies is Bramble Berry’s only official distributor. Aussie carries most Bramble Berry colorants, fragrances, molds and more. Aussie also has its own learning library full of recipes and tutorials, as well as an active Facebook page. If you live in Europe and the UK: You Wish Soap Supplies is located in the Netherlands, and it’s a great option for European soapers. You Wish carries Bramble Berry colorants, fragrances, exfoliants, soap bases and more. You can find You Wish on Facebook and Twitter. Keep in mind that although these outlets supply Bramble Berry products, our most complete selection of products come from our flagship warehouse in Bellingham, Wash. If you do decide to order internationally from Bramble Berry, keep in mind that all shipping rates are determined by the weight and size of your package, which can be quoted by our online shopping cart. To get a quote, simply place your items in your shopping cart and enter your shipping information. We are unable to ship anything to Italy or Greece, and we can’t send Russian customers any order valued over $75 USD. We are unable to ship any botanical products from Bramble Berry to New Zealand, Korea or Japan. Some colorants from Bramble Berry are unable to ship to Mexico. The world is a very big place, and we are unable to know the intricacies and details of every country’s rules and regulations. To be totally sure you’ll receive the items in your international order, please speak to your local customs agents. You can also try Googling the shipping restrictions in your country. For European customers, the Importing Cosmetics into the EU website is a great place to start. International customers can place orders through the shopping cart just like domestic customers, but for any special circumstances or questions, use the purple support tab located on the left side of the Bramble Berry homepage. You can also submit a ‘ticket’ through the help desk, which is the same as sending us an email. We are so proud to support such a broad, diverse community of soapers from all over the world! Do you ship fragrances to Sri Lanka? I am not familiar with Germany’s regulations on soaping. You may want to research the agency that regulates food and cosmetics. Their website might have some information! I know I am not an official supplier but if anyone in South Africa needs your micas, pigments and Oxides we supply many of them. Thanks for a great blog with many helpful hints and tips. That’s so great, thanks for the kind words! I actually just got back from vacation in Iceland a few months ago, your country is beautiful :). Thanks for the suggestion, I will definitely pass it along! So proud we are Europe’s BrambleBerry supplier! In about two months we are moving to a much larger warehouse so we can add even more BB products! Yay! I enjoy your blogs and so want to order your products, however the shipping costs to South Africa are ridiculous. Hopefully this will change in the not to distant future…maybe a distributor, if you are looking…? I love Brambleberry and all the products and tutorials you offer and I DO currently purchase most all my stuff from you because I love the convenience of the 7# microwavable bags of oils and quality of your fragrances. However, sadly, I am always searching for better options due to the darned shipping costs to the east coast! If Brambleberry can have an official distributor in Australia, why not one right here on the other side of the US? I hope in future to be able to send to Greece! We from YouWish Soap do ship to Greece! We are mentioned in the blog above. If you have any questions don’t hestitate to contact us. Well, you guys either need to get a distributor in Canada or do a lot better on finding a cheaper way to ship products here because BB’s prices for shipping here are exorbitant, even by US standards. I love this blog and everything BB has to offer and I’d dearly love to support you, but I simply can’t afford to shop BB because of your shipping prices. Example – it’d cost $35 to ship 1oz of mica here from BB. That’s pretty outrageous anyway you slice it. Comparatively most other US suppliers I’ve checked are generally about one third of that – $10-$15 dollar range for 1oz mica. If I were you I’d definitely be asking whoever is in charge of shipping why that’s the case and if there aren’t cheaper alternatives because you’re leaving a lot of money on the table that would otherwise be going to your bottom line. This is why I get a lot of international stuff I can’t get here either from Etsy or China directly. And the vast majority of that stuff generally qualifies for free shipping – even expedited, usually through DHL, or no more than $5. So I don’t know how they can manage to do that so cheaply from the other side of the world when you guys are about 15 minutes from the Canadian border. Oh well, food for thought. Thanks as always for your excellent work though Ann-Marie, it’s always appreciated. We are hopeful to be able to offer more shipping options soon. Thank you for the thoughtful comment. Unfortunately shipping to Canada is expensive because it is international, and while we are so close to the border, it is still considered a different country. Frustrating, I know! We are hoping to be able to expand our shipping options soon :). Thanks for being a customer, and a reader!